Protecting your business by setting up a secure document destruction program with Shred All is easy and contract-free. Our experts will help you through the following steps on your way to greater confidentiality and security. 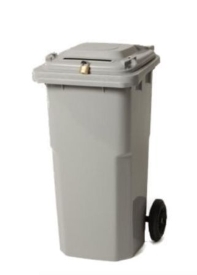 Shred All works with your company to determine the type of collection bins that you require. We provide you with complimentary security containers as long as you use our service. For offices, the first choice is usually the Executive Console. It has a gray laminate finish that fits into most decors and offers a flat top that can be used for additional storage space. The console has a front slot to insert your confidential papers for shredding. It provides ease of collection for sensitive documents in your office. Its internal and external locking system secures the lid to the container to prevent tampering and the removal of sensitive documents. These centralized collection units are great for use in organizations and companies where collections are high and frequent. Our Shred All experts help you set your custom shredding frequency and collection times that best suit your needs. At the scheduled time, our truck will come to you and our bonded employee will discretely remove the collected documents to be shredded and destroy them at your premises. 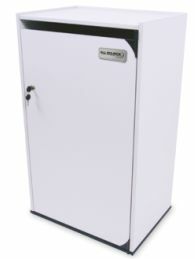 The bin lift and hopper feed system quickly destroy your confidential documents on-site. This fast and efficient automated system lifts the container into the truck and then tips the bin, releasing the contents into the shredder. Upon completion, you are issued a Certificate of Destruction certifying the time and date that your documents were destroyed. Let Shred All help you find the office shredding solution that fits your individual business needs. For a free estimate, 1-888-718-2448 or apply online today.